Is There a Yoga Pose That You Hate? When I first started my Yoga journey, Downward Dog made me angry. Like, boiling angry! It brought up a lot of doubt and created resentment towards anyone lucky enough to be practicing with me that day. I hated the teachers who continually seemed determined to spend 50 percent of each class back at Down Dog and I won’t share with you the words that rang out in my brain when they decided we needed to be there for 5 breaths…. I thought the day that I perceived Downward Dog as a “resting” pose would never come. I quite often quit and lay down in Child’s Pose to give my burning shoulders, wrists, and hamstrings a break from this “restful” posture. But in every class I took, the teacher (a wide variety of teachers all coming to yoga through very different paths and teaching styles) insisted on Downward Dog and eventually over time I actually began to relax into it. I soon discovered that the tension this posture was trying to rid me of, was what was causing my muscles to burn and shake. Once I was able to relax into the posture and stop trying to hold all of my muscles and limbs “up”, the discomfort started to ease and I could go even deeper into the pose. 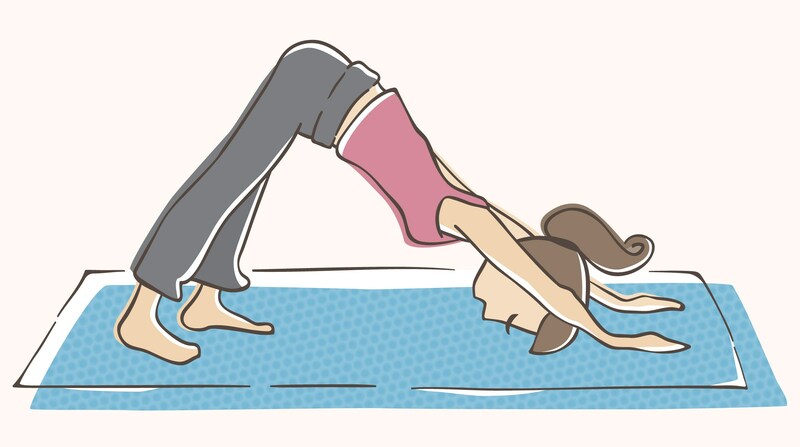 When I began teaching Yoga and discovered why downward dog was so prevalent in classes taught in my neck of the woods, I actually appreciated and grew to love this pose. For those of you new to Yoga, Downward Dog is the pose in which hands and feet are on the ground and your hips are pushed up and back toward the ceiling to create a lop sided/inverted V. Picture your dog getting up from a long nap and doing that crazy front-end-down, back-end-up stretch they do. That’s it! This pose is great for everything that plagues the society you and I both live in. It is a great shoulder stretch to ease the tensions of the daily grind. It stretches out your lower back and hamstrings that have cramped from sitting too long at your desk or being behind the wheel. It grounds you, and your now elongated rib cage allows for full deep breaths as you rest between poses!!!! OH, OK, I get it! This pose hits us where we all tend to lie in this day and age. It turns our gaze inward and upside down so that we can focus less on the perfect Yogi in front of us and more on our own core being. It is an inversion that most can handle and it engages most of the major muscle groups when performed properly. Downward Dog also levels the Yoga playing field. It is accessible to most, and although to the trained eye there is a big difference between a seasoned down dogger and a new pup, it can be achieved by most and can offer benefits to even those who have been practicing since the 70s. Downward Dog releases tension from our wrists and allows our necks to hang, our shoulders tend to give our ears the space they deserve in this posture, and our lower back decompresses, all while we are at rest. If you only have limited time for yourself today, hit the ground on all fours and allow your downward facing dog to ground, stretch, and relax you. Your stressed out body will thank you – eventually.